High Efficiency: These lab scale fractional distillation systems have up to 50 theoretical plates at atmospheric pressure. The very efficient distillation column is well suited for producing high purity materials and making difficult separations. Customized for your Application: The 9600 lab scale distillation system can be configured according to your needs. 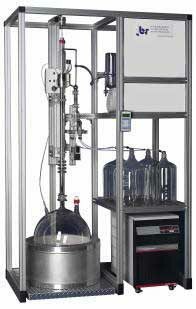 Automation, vacuum systems, fraction collectors and other accessories can be integrated into the distillation system as needed. The result is a distillation apparatus customized to your specific needs. Easy to use: The fractional distillation process is fully automated from beginning to end, minimizing the time needed to operate the equipment. Easy programming of parameters makes you feel like a distillation expert. Heating, collecting of distillate and shut down of equipment at completion are all done automatically. Optional control from a PC is available. Contact a representative at BR right now for information or a free quote to meet your specific needs.